There are many different renewable energy opportunities that are being utilized worldwide at this time. Renewable energy comes from natural resources like sunlight, geothermal heat, tides, rain, and wind. Solar power, by use of solar panels is one of the most popular of those energy types. A solar panel is a photovoltaic module or panel and is an assembly of solar or photovoltaic cells. Each panel is used in a larger photovoltaic system to supply power for various applications. Many businesses and residences have turned to solar power in an attempt to use cheap, clean, renewable energy. A photovoltaic array is used in most cases where a large amount of power is needed. A photovoltaic array is a group of several solar panels that are linked together to gather more solar power. The entire solar panel system installation will include a photovoltaic array, an inverter, batteries, and wiring to interconnect the items. Solar panels are readily available for purchase from local distributors or can be found at various internet web sites as well. The cost of solar panels would vary based on size and the amount of panels that a consumer would like to buy as many retailers will offer discounts for multi-panel purchases. It is always very important to check any shipping costs and warranty information on any solar panel that may be purchased. Whether the solar panel is being installed on a business or a residence the placing of the panels are of vital importance. Solar panels are normally installed on standalone facilities, building tops, or roof tops. The panels must be put in a place that it will get unimpeded direct sunlight all year long. If there are any obstructions to the panels getting full sunlight, especially during the peak midday hours, the photovoltaic system will not be operating at peak efficiency. Once the panel placement is chosen and the panels are installed the consumer will also need to choose an inverter for their photovoltaic system. The inverter is used to convert the direct current (DC) from the solar panels to usable household alternating current (AC). To properly convert the current received from the photovoltaic array an inverter must be used. There are some solar panel manufacturers that have begun selling panels with microinverters built into each solar panel individually. 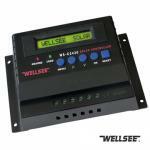 This system is relatively new and is considered to be highly efficient at detecting if each panel is properly placed since an individual can check the output from each panel separately. This type of system is also easily expandable as a consumer can purchase a few panels then add a few more on later without having to revamp the entire photovoltaic array. Renewable energy is something that many businesses and personal users are installing at record rates. If someone is going to choose solar power as a form of energy to use it is important to select the appropriate size panel and have it properly positioned to maximize the capture of sunlight during the entire year. This panel process happens because the electrons in the silicon atoms that make up the photovoltaic cell exist in various energy states, and at the highest energy state, which is achieved after absorbing energy from sunlight, they become free of the atom and are conducted away from the solar cell as electric current. There are four types of solar panels that are commonly manufactured and used: single-crystal, polycrystalline, ribbon, and amorphous silicon cells. Most photovoltaic cells are single-crystal silicon cells. They are made by purifying, melting, and crystallizing silicon into ingots. These ingots are then sliced wafer-thin, each wafer becoming an individual cell. Single-crystal silicon solar cells have a uniform color. They are normally blue or black. A metal grid conducts the electrons released by the cell in operation and a lead conducts the collected electrons away as an electric current. Polycrystalline photovoltaic cells are made of a lower grade of silicon than single-crystal cells and are cheaper, but less efficient at producing electricity. Ribbon silicon cells are produced by forming the molten silicon into a ribbon rather than an ingot. All three of these types of photovoltaic cell work essentially the same. The last type of photovoltaic cell, amorphous silicon cells, is different from the other three in that it has no uniform crystalline structure. Amorphous silicon photovoltaic cells are also known as thin film silicon cells. Amorphous silicon cells are manufactured by allowing very thin films of silicon to form from silicon vapor onto a base of plastic, glass, or metal in a vacuum. The energy potential of amorphous silicon cells is less than half that of crystalline silicon cells. Also, the cells undergo a steep drop in efficiency within a few weeks after being first put to use, usually about a 15% decline after six weeks. However, they are potentially much cheaper to manufacture than crystalline cells, so research is in progress to improve the efficiency. 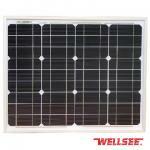 Wellsee solar panels are now under promotion: USD1.1/W, welcome to contact!